HOUMA, La. -- If Bill Cassidy wins the Louisiana Senate contest, it may have more to do with President Obama, Harry Reid and Mary Landrieu than with him. And that's just fine with Cassidy. The third-term GOP congressman from Baton Rouge is hoping to wrest the seat from Democrat Landrieu in what promises to be a tight contest -- one that could determine which party controls the Senate for the last two years of the Obama administration and who sits atop the powerful Senate Energy and Natural Resources Committee -- a perch now occupied by Landrieu. Cassidy is more than happy to capitalize on the national implications of his race. "Eighty-five percent of this vote is a referendum on Senator Landrieu and her support for President Barack Obama 95 percent of the time," Cassidy told E&E Daily over a cup of sweet tea last week at a McDonald's in Houma, after touring the nearby Port of Terrebonne. He was crisscrossing the state during the congressional recess, looking to drum up support as the Senate campaign heads into the home stretch. Cassidy, 56, is tall -- 6 feet 1 inch -- and clean-cut with close-cropped gray hair. He wore a blue-and-white-striped shirt tucked into khakis during his swing through Houma, a city in southeastern Louisiana about an hour from New Orleans. He wore a stretchy red campaign bracelet that said "Geaux Bill" -- a play on the word "go" -- and he had "TY" scrawled on the back of his hand. "I need to write some thank you notes," he said of the temporary ink. When he talks about the campaign, he's liberal in dishing out criticism of Landrieu, linking her whenever possible to Obama and Reid, the Nevada Democrat who holds the reins in the Senate as majority leader. "[Obama] wouldn't get his agenda through if she wasn't there supporting Harry Reid," Cassidy said during a meeting with David Rabalais, executive director of the port. 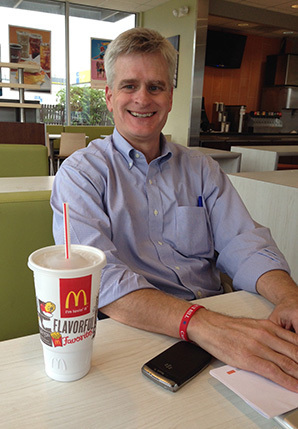 Cassidy enjoys a sweet tea at a McDonald's restaurant during a campaign swing through Houma, La. Photo by Robin Bravender. Reid "runs the Senate like a plantation," Cassidy said. "So instead of the world's greatest deliberative body, it is his personal, sort of, 'It goes if I say it does, if not it stops.' Senator Landrieu's first vote for him to be re-elected means that every other wish for a pro-oil and gas jobs bill is dead. Reid will never allow a pro-oil and gas jobs bill." Cassidy's anti-Washington, anti-Democratic messaging is getting some traction in Louisiana, where GOP candidate Mitt Romney won 58 percent of the vote in 2012, compared to Obama's 41 percent. "I'm pulling for y'all," Rabalais told the candidate. "A lot of people here are." Neither Cassidy nor Landrieu appears to have enough support to see him or her across the finish line in the state's Nov. 4 open primary, according to recent polls. A Real Clear Politics roundup of recent polls shows both candidates receiving less than 40 percent of the vote in November -- putting them short of the 50 percent needed to avoid a runoff in December. Rob Maness -- a retired Air Force colonel who has the backing of some Louisiana conservatives -- is another GOP candidate for the Senate seat but has trailed both Landrieu and Cassidy in the polls. If the race goes into a December runoff, things look even better for Cassidy. He's up 1.3 points over Landrieu in a head-to-head race in December, according to an RCP average including polls from June through early September. It's a narrow lead, to be sure, but indicates that Cassidy could shore up most of the support now pledged to Maness if there's another round of voting. Landrieu has been forced into runoffs in all three of her Senate elections and has never taken more than 52 percent of the vote. Cassidy, a doctor by training, is mild-mannered and charismatic, but he doesn't come across as a born politician. "He's certainly not a classic Louisiana retail politician," said Jeremy Alford, publisher and editor of LaPolitics.com and LaPolitics Weekly. "This really is his first time in any kind of major spotlight. In my one-on-one encounters with Dr. Cassidy, he's come off as sort of wonkish, buttoned-down. I think he's not one to go off the script very much." He's served in Congress since 2009, but by and large, Louisiana voters don't know Cassidy very well, said Stuart Rothenberg, editor and publisher of The Rothenberg Political Report. "I think people think he's kind of generally likable, but he's not a candidate who has kind of lit a fire under the party's grass roots," Rothenberg said. "There are a lot of conservatives who don't really like him, don't really trust him -- tea party types." Cassidy is not a "blood-and-guts kind of candidate, which is frankly good these days for the Republicans," Rothenberg added. "As the Republican standard-bearer in a runoff, most Republicans will look at him and say ... 'Do I want Obama, or do I want Cassidy?' and in that case, Cassidy looks pretty good." As the head of the Senate energy panel, Landrieu, now finishing her third term, can dangle her gavel in front of voters as a symbol of her clout on Capitol Hill. It's no small selling point in a state that's home to a behemoth oil and gas industry. But, Cassidy tells his supporters, the Pelican State would be better off with Republicans running the show in the Senate. "I tell folks any Republican as a majority leader and any Republican as head of the energy committee will get far more done for Louisiana workers than Harry Reid and Mary Landrieu," Cassidy said. When it comes to energy issues, the two candidates don't appear to be that far out of sync. "I think you'll be hard-pressed to find Landrieu and Cassidy voting differently on oil and gas issues," said Alford of the Louisiana political website. Still, Cassidy argues that as head of the energy panel, Landrieu hasn't been able to do much for the state. 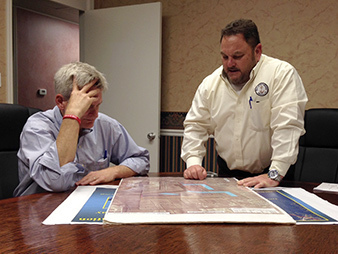 Rep. Bill Cassidy (left) meets with David Rabalais, the executive director of the Port of Terrebonne. Photo by Robin Bravender. "She said her top priority was getting a Senate floor vote on a Senate Keystone XL pipeline [bill]. Did she? No," Cassidy said. "She couldn't get a vote on her top priority. Now, I can promise you, if there is a Republican who is the Senate majority leader, we're going to get a vote on Keystone XL pipeline," he said. "When she says that she will vote for Harry Reid's re-election as Senate majority leader, that's her first vote. That means every other wish after that bends to Harry Reid's will." Landrieu did hold a committee vote in June to fast-track approval of the proposed Keystone XL pipeline, which Cassidy and other congressional Republicans called a political move, given the slim chances that Reid would allow floor time for the legislation (Greenwire, June 18). After Cassidy criticized the vote in June, Landrieu's campaign fired off a statement criticizing her opponent. "Congressman Cassidy can't have it both ways. He can't call for a vote and then get upset when it actually takes place," said Fabien Levy, communications director for the Landrieu campaign. They also appear to agree on reining in some U.S. EPA regulations. "We would also like to rein in the EPA regulatory regime," Cassidy said last week. Landrieu, he said, is "all for that, too. Harry Reid will never allow that. So it's cheap talk to say that you really want something when your first vote eliminates the possibility of all those things you profess you were for." Cassidy said he does disagree with "some" of Landrieu's stances on energy. "She voted against a fracking bill once as a favor to [former Colorado Democratic Sen.] Ken Salazar," Cassidy said. And what really matters, he added, is her ability to get things all the way to being signed into law by the president. "You can have all the good wishes you want. As they say, 'If ifs and buts were candy and nuts, we'd all have a Merry Christmas,' right?"